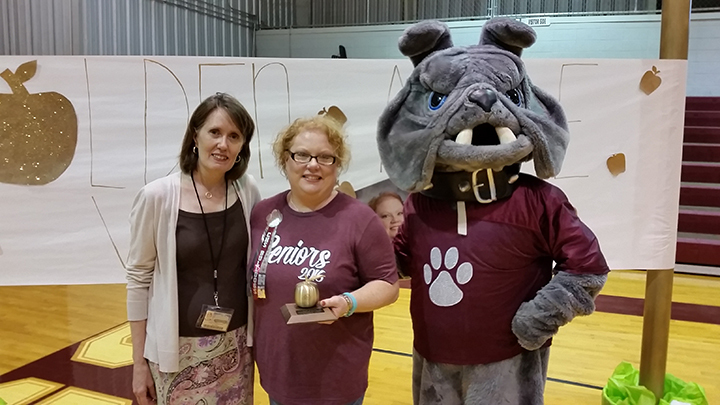 CLARKDALE – A teacher at Clarkdale High School who thought she was attending a pep rally was surprised to learn it was a set up to announce she had been chosen as the first Golden Apple Award winner of the 2015-16 scholastic year. 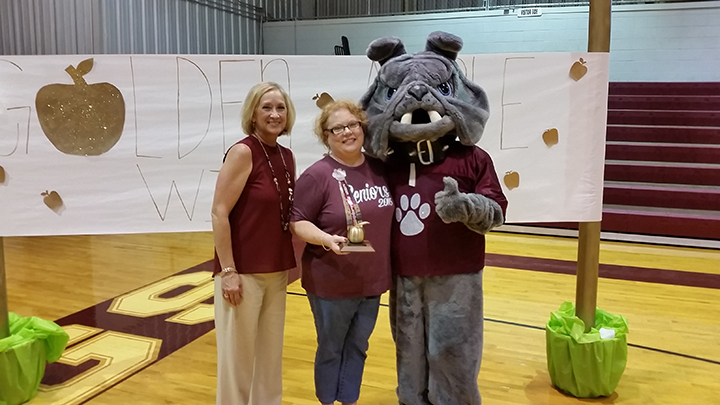 English teacher Julie Rawson, a 28-year teaching veteran at Clarkdale, was selected as the September Golden Apple Award winner. 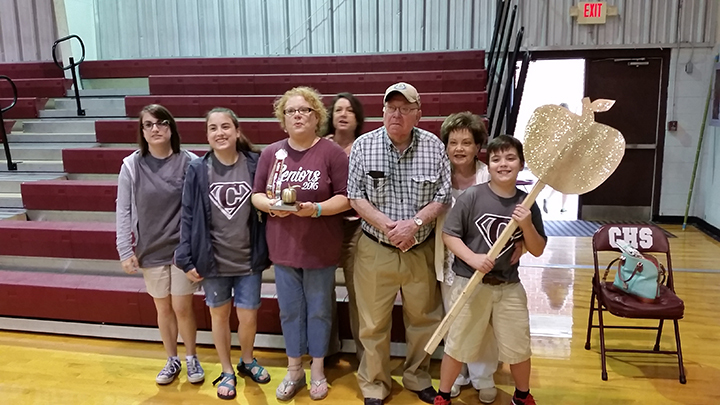 She was stunned to learn the impromptu pep rally last week was for her and not the unbeaten Clarkdale Bulldog football team. "We don't usually have pep rally's for away games," Rawson said. "And then, when Mr. (Wayne) Henson starting to talk about this teacher being here 28 years, well, I know I'm the oldest and it dawned on me, they are fixing to give me a Golden Apple." 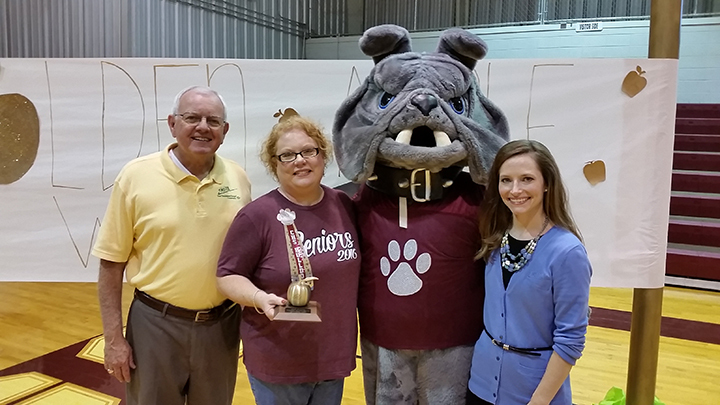 Henson is the president of East Mississippi Electric Power Association and the September presenting sponsor of the Golden Apple Award, back for its fourth year in saluting the hard work and excellence of teachers in the East Mississippi and West Alabama region. 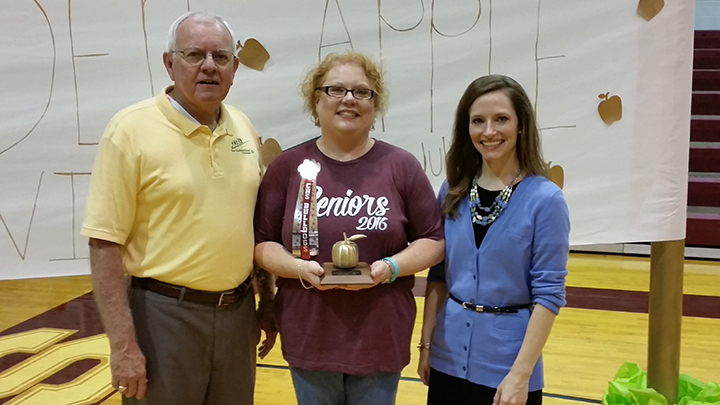 As a Golden Apple winner, Rawson received a $300 cash prize, a Golden Apple Award trophy, a $150 donation from an "Adopt a Classroom" account and a donation of school supplies for her classroom. Rawson is eligible for the Golden Apple Award Teacher of the Year, who will be chosen at the end of the school year from among the eight Teacher of the Month award winners. The Teacher of the Year will be announced at a banquet for all the Teacher of the Month winners. The Teacher of the Year will be given $2,500 in cash and a $2,500 scholarship to give to the student of his or her choice. 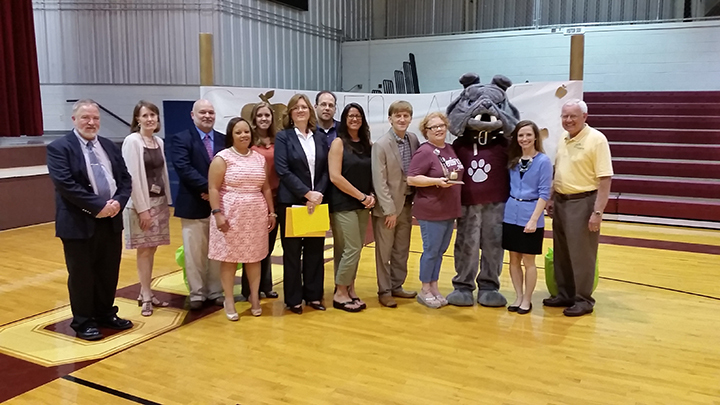 Clarkdale Principal Cheryl Thomas said Rawson was deserving of the honor. 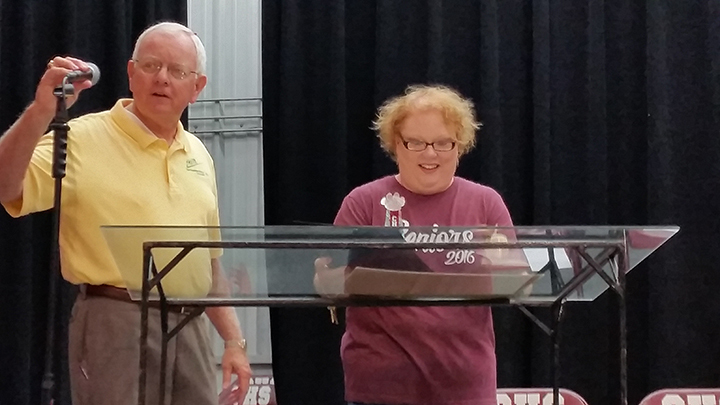 "She has such passion for her students, for teaching and for learning," Thomas said. "She uses things that are very creative that helps the students. She sent me an email just the other day about the concern she had for one of her students. She is always trying to look into what the students' needs are, whether it be instructionally, socially or emotionally. When you go in her classroom you notice it is decorated to the hilt because it is all student-centered." Rawson's classroom walls are filled with pictures from past senior proms. She is the sponsor of the school's prom, something the school did not have when she first started teaching at Clarkdale, 28 years ago. "The students came to me and said they were the only county school that didn't have prom," Rawson said. "I was just 21 when I started, but I became the prom sponsor." While her love for Clarkdale is evident, Rawson discovered her love of English and the path toward her teaching career when she was a student at Northeast Lauderdale High School. "In eighth grade, I had Lucille Boyd's class," Rawson said. "She loved her job and her enthusiasm spilled over to me. I loved grammar. Then I went to 10th grade and through 12th, it was Clara Godine. Being an English nerd, I knew then I wanted to be a teacher. There was never a doubt. I love what I do." 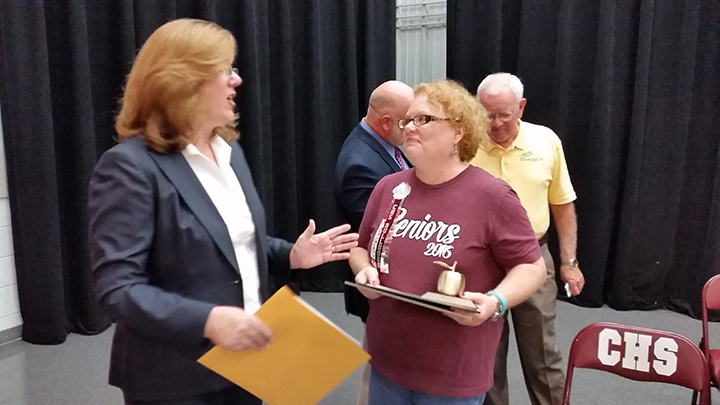 After 25 years, teachers in Mississippi can opt to retire, but Rawson chose not to. "It's never been boring to me," she said. "I've taught Beowulf for 28 years, but the students are new every year. It's always different. It helps to have a supportive family. I could have retired a few years ago, but I didn't because I still love it." Rawson is the daughter of Jim and Glenda Rawson. After graduating from Northeast, she went to Meridian Community College and then to Mississippi State University where she received her bachelor's degree in English Education. She later got a Masters of Science degree, also from MSU. She is also a National Board Teacher. "Miss Rawson loves her students and does her job very well," said one of Rawson's ninth grade English students. "She makes her lessons fun and funny. She is one of the best English teachers that I have had." Rawson said her focus, however, is not on being liked but on getting her students prepared for collegiate work and beyond. "I'm not going to be your favorite teacher right now and you will complain about how I make you write these essays and all the work I make you do," Rawson said. "But, what I am looking at is when you are in college. I get all these texts and messages that thank me because they just made the highest grade on their paper or there were no errors on the last essay. What I taught them in class is paying off for them. "After 28 years, I think I know what I'm doing. Even if they don't thank me when they are seniors, they usually do later. This award validates what I'm doing." 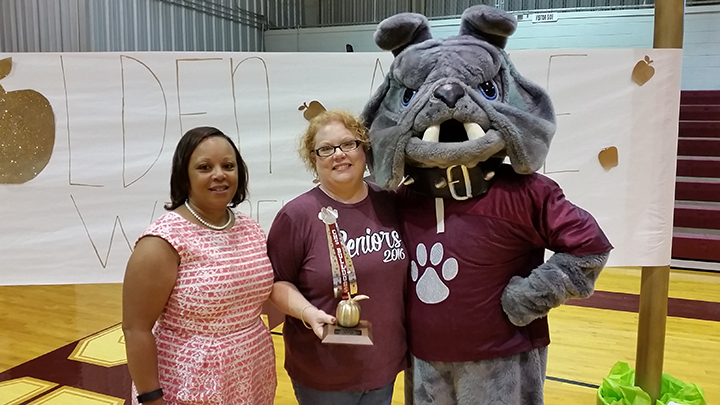 The Golden Apple Award is open to any teacher in grades kindergarten through 12th who works in Lauderdale, Neshoba, Kemper, Clarke and Newton counties in Mississippi, or Choctaw and Sumter counties in Alabama.